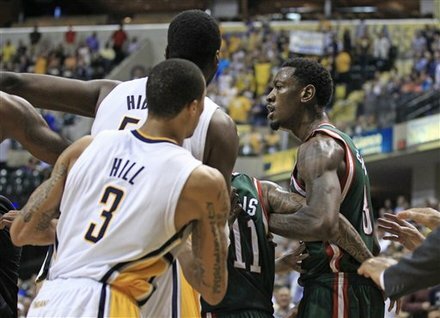 Apparently, Milwaukee Bucks forward Larry Sanders was really pissed off in last night's loss to the Indiana Pacers. It is not often that a player tries to fight multiple players of the other team but Sanders lost his mind last night after fouling out by trucking Danny Granger and then tried to scuffle with George Hill and David West. Let's go to the videotape.